Home made Mother's Day gifts are always well received even if your efforts don't turn out exactly as expected not one will appreciate the effort you went to more than your Mom will. This sesame brittle broken up into shard and tied in a bag with a pretty ribbon is a lovely home baked gift for Mother's day and it doesn't take long to make either. Mix the salt and baking soda into the sesame seeds. 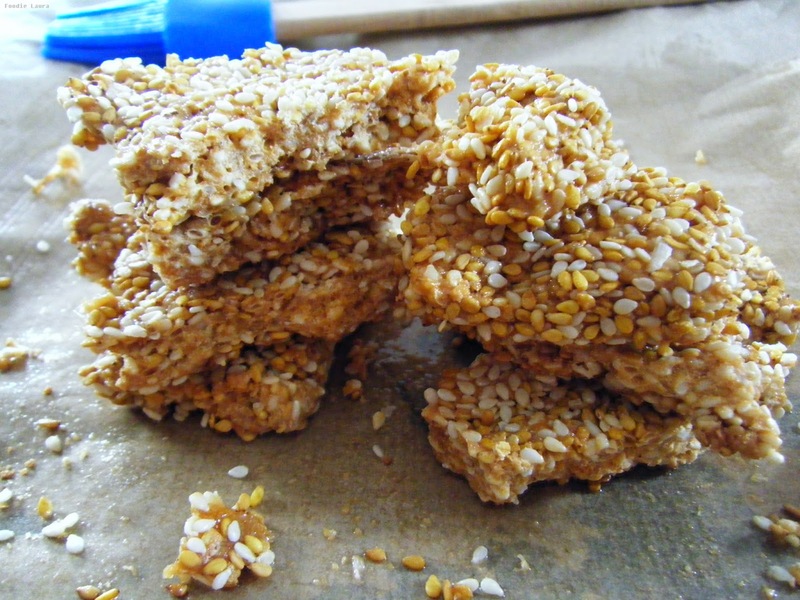 I used a mix of 40g of toasted sesame seeds and 40g of plain, you could also throw in black sesame seeds too. It makes the finished product look more appealing with the mix of colours and I like the mix a flavours. If you've only got one type of sesame the recipe will still work just fine. 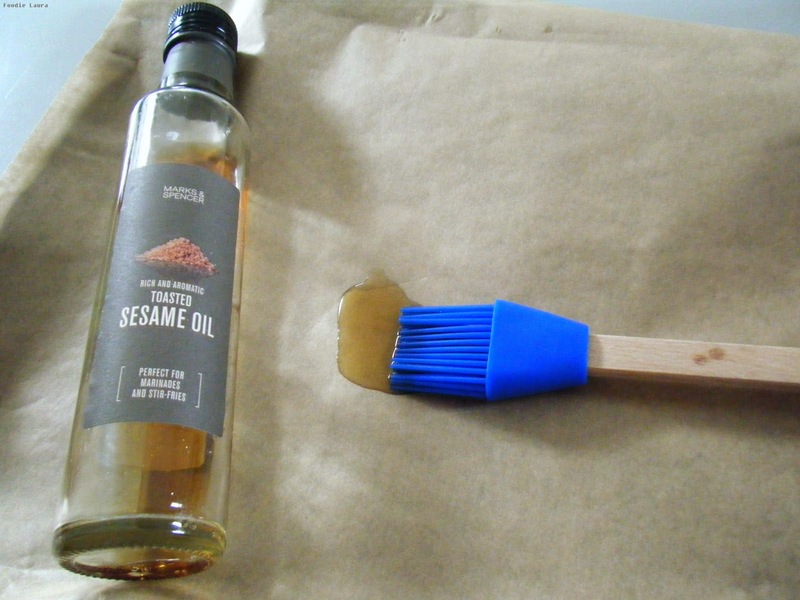 Place a sheet of baking paper onto a tray and brush it with sesame oil. 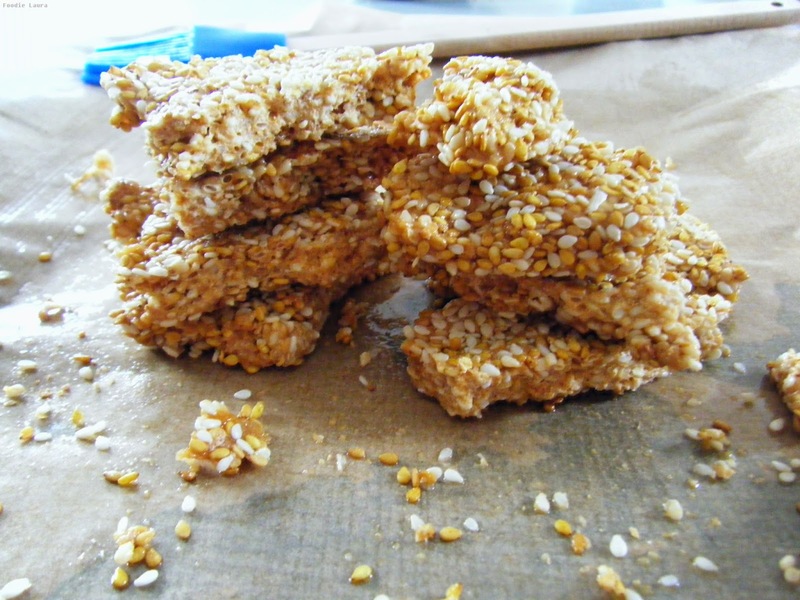 The brittle shouldn't stick to the paper but the oil gives and extra layer of sesame flavour. Warm a frying pan over a medium heat and pour in the sugar. Now you just have to leave it to melt into a thick treacle. Don't stir it as the sugar will crystallise. You can give the pan a little shake if needed just after you put the sugar in. I'm impatient and I'm always tempted to whack the heat up so the sugar melts quickly, don't do it. The sugar will go from dark lovely toffee to burned bitter toffee very quickly if the heat is too high and trust me, you do not want to have to clean that pan. When the sugar is melted and bubbling take it off the heat and quickly add the sesame mix, stir it vigorously to spread the sesame though the toffee then pour it out onto the greased paper. You need to work quickly as the brittle will set very quickly. The baking soda will react with the hot sugar and bubble and foam in the same way it does in a cinder toffee recipe. This makes the sesame brittle lighter and less dense but if you want a glossy solid toffee you can omit the baking soda. The brittle will be set hard as soon as it cools, depending on the thickness this takes around 30 mins to an hour. Then take the a heavy rolling pin and bash the brittle into pieces. Wrap it up prettily and your home made sesame brittle gift is ready to go. Do you make your own gifts for Mother's Day?